Frozen shoulder (or adhesive capsulitis) can be a very painful, debilitating condition. It is a condition that leads to the shoulder joint becoming very stiff and painful to move in all directions. It often starts without any warning and goes through three phases. 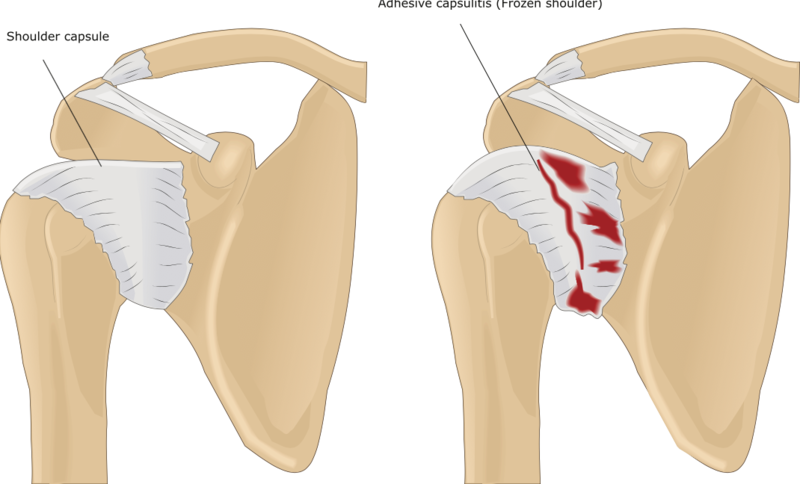 The shoulder joint capsule in a frozen shoulder becomes inflamed, red, swollen and contracted. The first phase is described as the inflammatory phase. This phase presents itself as a very painful shoulder. Patients will often find it difficult sleeping. The shoulder is often painful at rest and is usually described as a deep ache but can also be sharp. The second stage we describe as the frozen stage. This is when the pain reduces but the joint stiffness kicks in. People will struggle to move the shoulder in this phase. They will find it painful to push their shoulder movement. The third stage is the thawing out stage. This is as the condition resolves. The range of movement at the shoulder joint improves and function is restored. The unfortunate thing for sufferers is that the whole process from stage one to stage three can take anywhere between 18 months to 2 years and in some cases even longer. The best time to catch a frozen shoulder is in the inflammatory phase. If anti-inflammatory medication is used in this phase you can prevent the frozen shoulder reaching the frozen phase. Physiotherapy. To prevent any further stiffness and regain some movement. You will not cause any damage by moving the shoulder. By not moving the shoulder you can cause yourself more stiffness and pain. Hydrodilation procedure. The idea with this is to inject the shoulder joint with fluid to stretch it. Surgery. A manipulation under anaesthetic or a capsular release may be considered. It is important with all the procedures listed that you move the shoulder joint with exercise. Speak to your GP or physiotherapist for further advice.